After killing it at the GOP debate last week, businesswoman Carly Fiorina received her first endorsement from a member of Congress for her presidential campaign Sunday. It's her first official endorsement from a major politician period — and that's one over Trump. Kansas Rep. Lynn Jenkins vocalized her support for the former Hewlett-Packard CEO in a statement submitted to The Topeka Capital-Journal, emphasizing Fiorina's private-sector experience. "As a CPA who practiced public accounting for nearly 20 years before coming to Congress, I recognize when a system is as badly broken as Washington is, it is best to look to the outside for a new direction," Jenkins said. 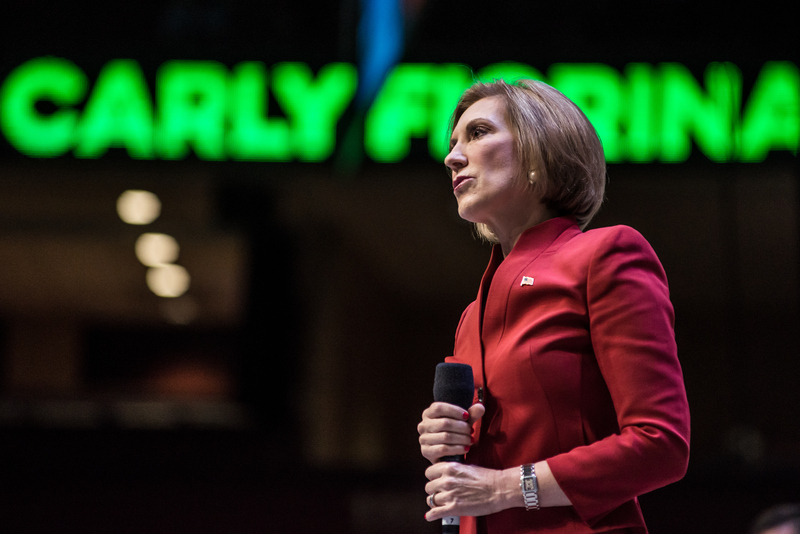 "Carly Fiorina is exactly the strong, steady, no nonsense businesswoman that our nation so desperately needs." Although Fiorina has the backing of former U.S. Rep. Nan Hayworth of New York and several state legislators, she had yet to acquire the stated support of a federal representative before Jenkins' announcement Sunday. "Starting as a secretary and fighting her way to the very top, it is clear this is not a woman who was handed things; she had to fight for every bit of success she has achieved," Jenkins went on in her praise of Fiorina. "She is proof the American dream still exists." Following her strong debate performance Wednesday, Fiorina is now second place in the Republican presidential field, according to a new national CNN/ORC poll. Conducted three days after the televised GOP spectacle, the poll shows that she has 15 percent of support, trailing behind front-runner Trump at 24 percent. Jenkins' endorsement, however, means Fiorina's now got very substantial advantage over Trump. The businessman has zero endorsements from congressmen, senators, and governors, and the same goes for Ben Carson, who ranks third in the poll. Interestingly enough, the ones doing well in terms of endorsement aren't so popular among the American people. According to a very handy chart created by FiveThirtyEight, the GOP candidates with the most stated support are Jeb Bush, Rand Paul, Chris Christie, and Ted Cruz. With 23 endorsements from top U.S. elected officials, Bush scored only 9 percent in the poll. Paul has 11 endorsements and 4 percent support from the public, while Christie and Cruz are tied with seven endorsements. For the record, the total number of all GOP endorsements accounts for only maybe half of Hillary Clinton's official political support — 30 senators, seven governors, and more than 100 House members. While polls and endorsements are two separate metrics for candidates' likelihood of success, experts believe the latter is much more reflective of voting trends. Before the official primaries, top politicians will gravitate toward candidates they think will win the party nomination. This period is known as the "invisible primary," FiveThirtyEight writer Aaron Bycoffe explains. He went on to quote a comprehensive study on the invisible primary, which found that "early endorsements in the invisible primary are the most important cause of candidate success in the state primaries and caucuses." Still, there something to be said about the American public's tremendous interest in political outsiders. If Fiorina can maintain her populist appeal while gaining support from establishment members, she just might have a chance.